Dorothy Camber met George Walton while he was attending the meeting in Savannah, where she lived with her family. Dorothy was then a teenaged girl, attractive, poised, with the dignity and decorum of a well bred British woman. She was apparently mature for her years, possessed of an unusually fine mind, warmed by a great capacity for love and loyalty, and capable of firm decisions. Dorothy’s father, Thomas Camber, was loyal to the Crown, and to him George Walton was a traitor to the king. Camber forbade his daughter’s relationship with Walton, but even her father’s wrath could not halt their courtship. George Walton married Dorothy Camber in 1775, and they had two sons: Thomas Camber Walton and George Walton, Jr. 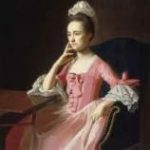 When the Revolutionary War broke out, Dorothy’s father returned to England and insisted that she go with him, but she refused to leave her rebel husband and remained with him during the perilous days thereafter. The continual abuse of colonial rights by the King and Parliament caused the Georgia Provincial Congress to finally join the other colonies in their efforts in July 1775, at which time five delegates were elected to attend the Second Continental Congress in Philadelphia: Lyman Hall, Archibald Bulloch, John Houston, John Zubly, and Noble Jones. One of these men turned out to be a loyalist, and in February 1776, George Walton was elected to take his place. Because of his position in the state militia, he was delayed in leaving Georgia, but finally arrived in Philadelphia in late June 1776, and he quickly gained recognition and respect from his colleagues. Walton voted for independence from Britain on July 2, 1776, and voted for the Declaration of Independence on July 4. At the age of twenty-six, Walton was the youngest man to sign the Declaration of Independence. He was also the only signer from the southern colonies who was not a plantation-owning aristocrat. In the fall of 1776, when Philadelphia was evacuated by the Congress, Walton stayed on in the city with fellow signers Robert Morris and George Clymer. 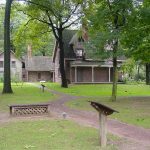 They were charged with procuring food, clothing and supplies for the Continental Army in nearby New Jersey. Walton did so at great risk to himself because of the many loyalists who were active in the town. He was reelected to Congress in 1777 and served there through the end of 1778. In November 1778, the British invaded Georgia. Upon Walton’s return to Savannah in December 1778, he was the senior colonel of the First Regiment of the Georgia Militia, commanding a battalion on the right of General Robert Howe’s army. When the British assaulted Savannah in late December 1778, the raw recruits were overwhelmed by the superior British forces. A slave showed the British a path around the city, and they were able to attack from two sides. During the defense of the city, George Walton was shot from his horse and severely wounded on December 29, 1778, his leg shattered by an enemy ball. He was captured by the British as they swept through Savannah, but fortunately for Walton, he received humane and skilled care for his wound from the British surgeons. He was later transported to a British prison camp in Florida, where he was held prisoner with other captured Americans. Finally, in September 1779, after nine months in captivity, Walton was exchanged for a British naval captain being held captive by the Patriots. When Walton was released, Savannah was still in the hands of the British. In October 1779, Major General Benjamin Lincoln ordered George Walton to go to Augusta, hold an election, and create a constitutional government in order to qualify for a subsidy from the Continental Congress. In Augusta, Walton joined a small group of Patriots, who were trying to reorganize a state government in order to continue to resist the British. Elections were held and an assembly met in late November, and at the age of 30, George Walton was appointed by the new assembly as the first Governor of Georgia. His brief term as governor was marred by his willingness to sign land grants above the legal limit for friends, government employees, and acquaintances. The British Supreme Executive Council refused to recognize Walton’s administration, so war-ravaged Georgia endured two Whig governments in Augusta and one royal regime in Savannah, at a time when it could hardly afford one government. In 1778, Walton was accused by General Lachlan McIntosh of participating in the creation of a forged letter that requested the president of congress to remove the General from his position. The Georgia legislature censured Walton in January 1783, and recommended that the attorney general institute proceedings against him. The censure came the day after Walton was appointed Chief Justice of Georgia by the same body of legislators. In January 1780, he was re-elected to the Continental Congress, and he continued to represent Georgia there until October 1781. He was then elected Governor of Georgia again in 1781, and served a full term in that position. In November 1788, Walton was appointed a Superior Court Judge for the Eastern Federal Judicial District. When the British were finally driven from Georgia in 1782, Walton returned to Savannah to try to rebuild his personal finances, which had been deeply eroded by the demands and destruction of the war. The economy of Georgia and of all American states continued to be severely depressed during the 1780s, and Walton was not able to re-establish a secure financial footing in Savannah. During the fifteen years after the war, the single most influential person in shaping Augusta’s history was George Walton. Since 1779, when he was Governor in Augusta, Walton had envisioned a rapidly expanding back country with Augusta as the hub. Walton helped write the 1780 legislation that outlined a modern plan for Augusta and provided free land in the back country. He was on the first commission charged with executing the law and was named again when the commission was re-created in 1783. Therefore, Walton was instrumental in laying out streets, selling lots, letting out contracts to build a new church and a bridge, hiring a schoolmaster, and launching Richmond Academy. He did his best to get the State University, chartered in 1784, for Augusta, suggesting that the Hill would be a healthy place, far enough removed from “the Varieties, tumults and vices of a large town,” and he had no doubt that Augusta would become a large town. Walton was instrumental in shaping the growth of the Hill area; his 250 acre tract of land on the crest of the Hill was divided into lots. He called the development College Hill and established a summer residence there. Walton had other extensive land grants, most of which he had to mortgage and eventually lost. Even before 1788, when he announced that he was officially establishing residence in Augusta, Walton stayed with his nephew, Robert Watkins at his plantation, Rosny, near New Savannah. By the mid-1780s, Walton began to divest himself of his property in Savannah and prepared to relocate his family. In 1790, while still Governor, Walton permanently changed his residence to Augusta, the state capital. He built Meadow Garden on the outskirts of the city on confiscated Loyalist lands he had acquired. In June 1791, Walton acquired two adjacent lots of approximately fifty acres each in Augusta Township, and it appears that he was living on the property by early 1792. By 1793, he was identifying himself as George Walton of Meadow Garden. Because his financial troubles never fully abated, and because he needed to insure that his family would not be deprived of their home, Walton never listed the property in his own name. Instead he had it listed first in the name of his nephew, Thomas Watkins, and then later held in trust by John Habersham and Anderson Watkins for his son, George Walton, Jr. When Walton was appointed a United States Senator in 1795, he wrote to his wife with advice about managing Meadow Garden. In the Yazoo Land Fraud of 1795, a feud erupted between Jackson and Walton over the sale of land to speculators. Jackson won, and Walton, who supported the sales, left political office. Walton then returned to Augusta, Georgia, where he took up farming, and became a trustee of Richmond Academy and the University of Georgia. Most of Walton’s public service during the 1790s and early 1800s was consumed by his duties as a judge of one of the state’s three superior court circuits. In 1799, he was again appointed a Judge of the Superior Circuit of Georgia, which position he held until his death. During the later years of his life, Walton suffered intensely from frequent and long attacks of gout, which probably contributed to his death. George and Dorothy Walton had reared two sons, one of whom, Thomas Camber Walton, died in December 1803, only a short while after he had been admitted to the practice of law in Georgia. George was reported to have been severely shaken by the tragedy, and it probably contributed to his own death. George Walton died at his home in Augusta, on February 2, 1804, at the age of 54. His funeral procession began at Meadow Garden, and he was buried at Rosney, his nephew’s plantation. On July 4, 1848, a large stone obelisk in front of the Richmond County Courthouse in Augusta was dedicated to the Georgia Signers of the Declaration of Independence – the Signers’ Monument. George Walton’s remains were re-interred there with fellow signer Lyman Hall. The body of the other Georgia signer, Button Gwinnett, was never located. Dorothy Camber Walton survived her husband by 28 years. In 1821, she moved to Pensacola, Florida, when her son, George Walton, Jr., was appointed territorial Secretary of West Florida. 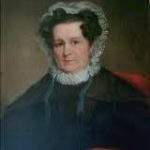 Her son later became acting governor of Florida during the administration of Andrew Jackson, seventh president of the United States. From various writings, it is obvious that Dorothy Camber Walton was widely known. When the Marquis de Lafayette visited Georgia in 1824, it was of Dorothy Camber he first asked, declaring that it was his one desire to see again that beloved friend of other and more troubled years. She was then too feeble to travel to meet the distinguished Frenchman, who had rendered such valuable aid to the American cause during the Revolution, but her granddaughter, Octavia, bore her greetings to the aging marquis. Dorothy Walton died at the home of her only son, George Walton, Jr., on September 12, 1832, at the age of 72. She is buried in Old St. Michael’s Cemetery in Pensacola, FL, where an ancient stone wall encloses her grave. Surrounded by a whitewashed brick wall in the old part of the cemetery, the grave is covered with a flat slab of marble. The house in which she lived In Pensacola was converted in 1938 into the Dorothy Camber Walton Museum. 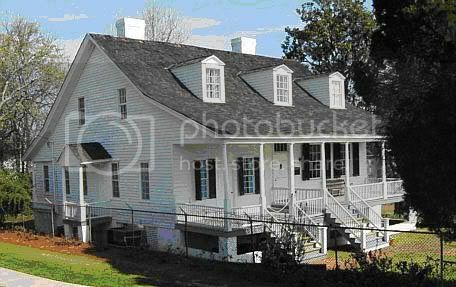 In this home, Mrs. Walton and her son frequently entertained Andrew Jackson during the time he was governor of West Florida. Originally the house stood in the midst of large grounds, and it is believed that the present house was part of a larger structure that was demolished in earlier years.